ESID’s comparative research on political economy analysis (PEA) within DFID and the World Bank demonstrates that the internal dynamics of aid bureaucracies constitutes the greatest obstacle to its dissemination. For PEA to have greater impact, its proponents will need to promote organisational change. In confronting this task, they are likely to face trade-offs involving their control over PEA, the sophistication of analytical work, and its ultimate impact on aid operations. We outline these trade-offs in terms of three potential strategies for PEA mainstreaming: professionalisation, programming and management. We conclude that it is not possible for PEA proponents to extend and deepen the use of PEA while retaining control over it: it is unlikely to remain a sophisticated and controlled agenda if disseminated across entire aid bureaucracies. Trade-offs of PEA mainstreaming are thus inescapable. 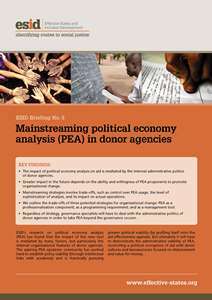 As the donor environment shifts towards lower aid dependence and higher efficiency demands, the future of PEA for donors may well rest on better political economy analysis of donors.